Made from beautiful white gold, this 14K white gold paisley bar necklace in 16" - 18" from Apples of Gold Jewelry is a fun and sophisticated necklace you won't want to miss! The 14K white gold necklace has an almost shining finish, and the pendant comes with a chain in your choice of 16" or 18" in length. The chain is attached to loops on both sides of the pendant to form a necklace. 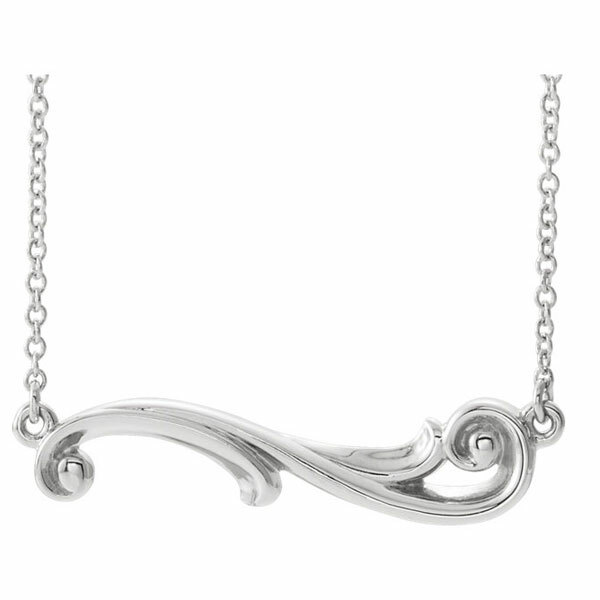 The swirling paisley design is a fresh take on the traditional bar pendant, with a wave along the length of the bar curling up on the end. The pendant measures just under 1 1/8" wide by 1/4" tall. We guarantee our 14K White Gold Paisley Bar Necklace, 16" - 18" Inches to be high quality, authentic jewelry, as described above.